We don’t think we need to remind you of Honda’s long history of leadership when it comes to advanced technologies and designs that enhance the safety of our vehicles, but sometimes, we like to brag. We have two of the most sophisticated crash test facilities in the world, and again, our hard work and efforts have paid off. That’s right! 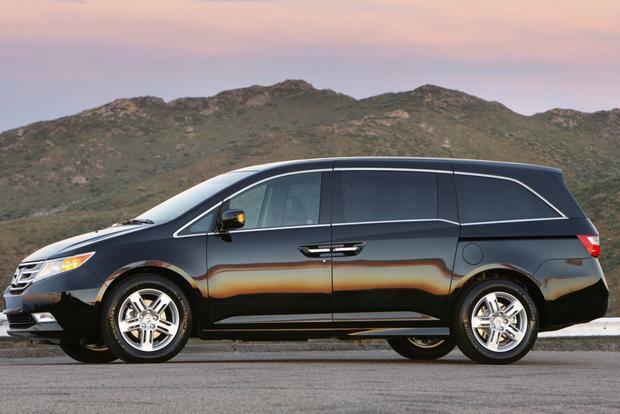 The newly updated 2014 Honda Odyssey has received a 5-Star Overall Vehicle score in the U.S. National Highway Traffic Safety Administration New Car Assessment Program. That’s the highest score available! That means we have the only minivan to earn the highest possible rating of Top Safety Pick+ from the U.S. IIHS AND the NHTSA NCAP 5-Star score this year. Honda loves its innovations, so enhancing occupant safety just made sense. The 2014 Odyssey has the next generation of our Advanced Compatibility Engineering™ (ACE™) body structure. So, the newest Odyssey is designed to improve frontal crash energy management through a wider range of offset and oblique collision modes. On top of that, other body reinforcements work with the stronger body structure to maintain the occupant compartment volume during a frontal collision. Honda’s standard safety and driver assistive technology includes vehicle Stability Assist™ (VSA®) with traction control; an Anti-lock Braking System (ABS); side curtain airbags (some vehicles equipped with a rollover sensor as well); dual-stage, multiple-threshold front airbags; and front side airbags. Speaking of airbags, Honda has applied a new kind of side curtain airbag in the 2014 Odyssey that provides additional protection if occupants move in a more angled trajectory in the case of offset crashes. We know it must feel like we’re constantly telling you about the awesome safety features in Honda vehicles, but can you blame us? If you want to see what all the fuss is about, click below to book a Dynamic Test Drive and we’ll prove just how great our vehicles are.